Although the New York Times works hard to attract readers in Southern California, its arts critics rarely venture beyond the confines of the East Coast. Thus, it was notable that Music Critic Zachary Woolfe made the trip west for Los Angeles Opera’s presentation of Mozart’s The Magic Flute, which opened last Saturday at the Dorothy Chandler Pavilion. Read his review HERE. What made the review notable was that Woolfe’s focus was to laud the company for reacting quickly (in opera-world terms) after CEO Christopher Koelsch went to Berlin to see Komische Oper’s new, radical production of Mozart’s famous work (read my preview story HERE). After returning to L.A., Kolsche persuaded colleagues Plácido Domingo and James Conlon that LAO should substitute the Komische Opera production for the originally announced revival of LAO’s 20-year-old production by Sir Peter Hall and cartoonist Gerald Scarfe. Although I haven’t seen the LAO production, to judge from the critics the decision to change was more than worth the risk. Jim Farber’s review in the Los Angeles News Group papers (which include my papers listed above) is HERE. Mark Swed’s review in the Los Angeles Times is HERE. Timothy Mangan’s review in the Orange County Register is HERE. What Woolfe didn’t say in his article was that Magic Flute was the first of two “last-minute” changes to the LA Opera 2013-2014 schedule. Six months after the season had been unveiled the company announced that it would add semi-staged concert performances of Andre Previn’s opera, A Streetcar Named Desire on May 18, 21 and 24, 2014. That omission was somewhat ironic, since Michael Cooper reported the story in the NY Times on Sept. 4. Renée Fleming will reprise her starring role as Blanche DuBois from the original San Francisco Opera production. Patrick Summers will lead the LA Opera Orchestra. The production will be the semi-staged version that played at Carnegie Hall in New York City and at Lyric Opera Chicago. DETAILS. Speaking of Mr. Woolfe, he posted quite an interesting article after attending nine — NINE! — performances of Bellini’s Norma at the Metropolitan Opera this fall. His premise was to evaluate how the Met sounds from nine different seat locations. Read the article HERE. Lisa Hirsch, in her “Iron Tongue of Midnight” Blog HERE, suggested he should have seen the Met’s production of Richard Strauss’ Die Frau ohne Schatten instead. To each his (or her) own. Nov. 23 and 30, Dec. 5, 11 and 13 at 7:30 p.m. Dec. 8 and 15 at 2 p.m. 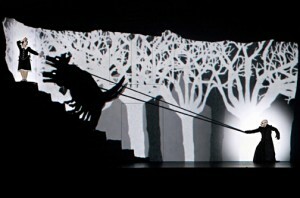 When Los Angeles Opera announced its 2013-2014 season earlier this year, one of the offerings was to be Mozart’s The Magic Flute, using a popular, 20-year-old production directed by Sir Peter Hall and designed with colorful cartoon-like sets by Gerald Scarfe that had been presented four times including its 1993 debut. Created by the British theater group “1927” — led by director Suzanne Andrade and filmmaker Paul Barritt — in collaboration with Australian Barrie Kosky, artistic director of the Komische Oper in Berlin, the production will be making its U.S. debut. This will also mark Kosky’s American debut as an opera director. Kosky says, “The rhythm of the music and the text has an enormous influence on the animation. As we worked together on The Magic Flute, the timing always came from the music, even — especially — in the dialogues, which we condensed and transformed into silent film intertitles with piano accompaniment. It’s a silent film by Wolfgang Amadeus Mozart, so to speak!” Beyond the black-and-white aspects, the production also includes a number of colorful images, including flying pink elephants. Conlon, who conducted the orchestra in the 2006 film version of The Magic Flute directed by Kenneth Branagh, will lead a cast that includes two Americans: soprano Janai Brugger, a LAO alumna, who will appear as Pamina, and tenor Lawrence Brownlee in his LAO debut as Tamino. Also making company debuts will be soprano Erika Miklósa as The Queen of the Night, bass Evan Boyer as Sarastro, and baritone Rodion Pogossov as Papageno. • The Hall/Scarfe production of The Magic Flute (which LAO owns) hasn’t been abandoned, said Koelsch when this new production was announced. It will be retained for possible future use. • Strong advance ticket sales encouraged the company to add the Dec. 8 presentation to the original slate of six presentations.